When an accident happens, the need to seek compensation for the injured party is quite obvious. This would be known as a bodily injury claim or a personal injury claim and would be for the person actually injured. However, sometimes other claims arise as a result of a bodily injury, such as when a spouse is also adversely affected by the injury. This is called a loss of spousal consortium claim. The spouse of an injured party has the right to pursue compensation due to the fact that his or her life with the injured spouse has been adversely affected, such as a personal relationship not being the same as it once was. Loss of spousal consortium claims are among a number of personal issues that include sexual relations, friendship, comfort, society and companionship, and can become the focus of litigation. The reason why this takes place is due to the added responsibility that the spouse must now deal with because of this injury, generating a loss of spousal consortium claim. 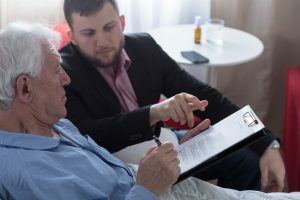 Often times a loss of spousal consortium claim can be worth as much as, and sometimes greater than, the injured spouse’s claim. Depending upon other circumstances, the value of loss of spousal consortium claims can be very substantial. While the facts of a marital relationship are the subject of litigation, it is well recognized by the court and sometimes well compensated by judges and juries. When this occurs, it is necessary to determine whether this type of loss of spousal consortium claim is worthy of litigation. Generally, the length of the marriage, the relationship of the injured party and their spouse, common activities, amount of time spent together and, whether the marriage produced children, are common issues to be considered in bringing such loss of spousal consortium claims. When a party is injured, and the resulting loss to the spouse appears worthy of compensation for loss of spousal consortium claims, then an attorney representing the spouse should immediately determine whether there is sufficient insurance to compensate the spouse, or whether there are sufficient assets of the responsible party to determine whether the responsible party can satisfactorily compensate the spouse. In addition to considering the issue of compensation for a loss of spousal consortium claim, there must be a determination whether the injured party and their spouse wishes to disclose the facts of the marriage during the course of litigation. Sometimes issues of pre-accident separation, spousal abuse, restraining orders, marital counseling and other personal information relating to the marriage may have to be disclosed. Before pursuing loss of spousal consortium claims, it is imperative to discuss with your attorney all aspects of the marriage and whether, after full disclosure, the injured spouse still wishes to pursue compensation.